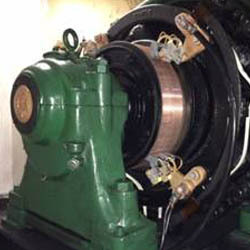 Electrically test the armature, field coils and inter-poles and record data. 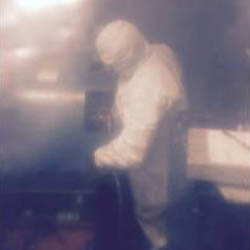 Using a small high speed blower, compressed air and nitrogen gas the coils of the armature are blown out to remove carbon that has accumulated over time. 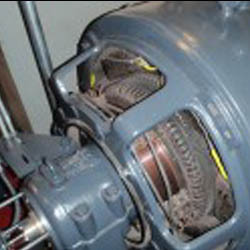 Clean and remove debris from the entire machine (loose paint, broken insulation, grease and carbon dust). 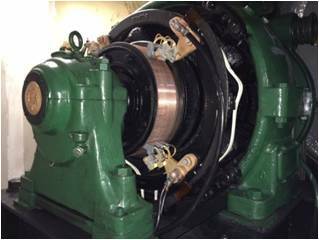 On gearless machines, the entire brush assembly is disassembled and the insulators inspected and replaced if necessary, the brush boxes and ring assembly bead blasted to remove grounds. Check and set the neutral plane on brush assembly if necessary. Check and set the cornering of brush boxes. 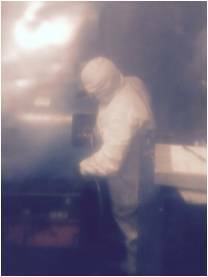 Apply a Class – F polyurethane spray epoxy to the armature and fields (the application of the spray epoxy helps to re-insulate the machine and keep out small particulates).